and Roverento which is a little south of Trentino. 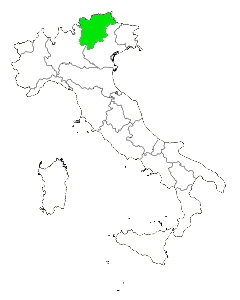 The region also shares two borders with other regions of Italy and they are Lombardy to the west and Veneto to the south. with breathtaking peaks and valleys almost everywhere one would be traveling. With this in mind it is easy to see why the major portion of Trentino-Alto Adige's economy is going to be tourism. If you are hiker the region is ripe with over 50 major hiking areas to choose from. With many diverse hiking trails and mountain biking trails everywhere, you could hike or bike for weeks without seeing the same trail twice.